German rabbi; born 1738 at Fürth, Bavaria; died at Cassel May 21, 1814. When quite young Berlin was dayyan in his native city, and at the same time rabbi of Baiersdorf, Bavaria. In 1789 he was appointed chief rabbi of Bamberg, where he remained until 1794. During the time he remained in Bamberg, Berlin was involved in a lawsuit which threatened to ruin his reputation. In his capacity of civil judge of the Jews, he was entrusted with the division of an estate valued at 100,000 fl. ($41,000), and was accused by one of the heirs of having utilized his judicial power for his personal interest. This was the more painful because the judicial procedure and practises of the rabbis had never before been assailed in the courts of Bamberg. The specific charges against the rabbi were that he accepted illegal fees and failed to account for certain small sums. In the mean time Berlin was elected to the chief rabbinate of Hesse-Cassel; and difficulties were placed by his opponents in the way of his leaving for the new post. However, he was never put under arrest, and subsequently was acquitted of all the charges of dishonesty and was sentenced only to pay a certain sum as a fine, in settlement of an account which seems to have been more entangled than dishonest. The documents relating to the trial are now published by Eckstein, showing that the charges against Berlin were groundless and that only personal hatred supplied the motives. In the summer of 1795 he left Bamberg for Cassel to enter upon his new functions. When the kingdom of Westphalia was founded, with Cassel as its capital, Berlin gave proof of his loyalty to the new régime by a sermon which he delivered in Hebrew in the Great Synagogue of Cassel, welcoming the new king, Jerome Bonaparte; and by composing a Hebrew song for the same occasion. Both were published, with a German translation, under the title "Dabar be-'Itto Mah Ṭob" ("Rede am Freudenfeste,". . . Cassel, 1807). This work is erroneously ascribed by Benjacob, in his "Oẓar ha-Sefarim," to Judah Löb Karlberg. When the Jewish consistory of Westphalia was organized on the model of the French consistory (October, 1808), Berlin was made chief rabbi, and in 1809 was elevated to the dignity of "Consistorialrath." As a director of the consistory he was in accord with its president, Israel Jacobson, and assented to the declaration that it is permissible to use pulse, tea, and sugar on Passover, against which view the conservative rabbis of the time vigorously protested (see Stern, "Gesch. des Judenthums," pp. 167, 168). 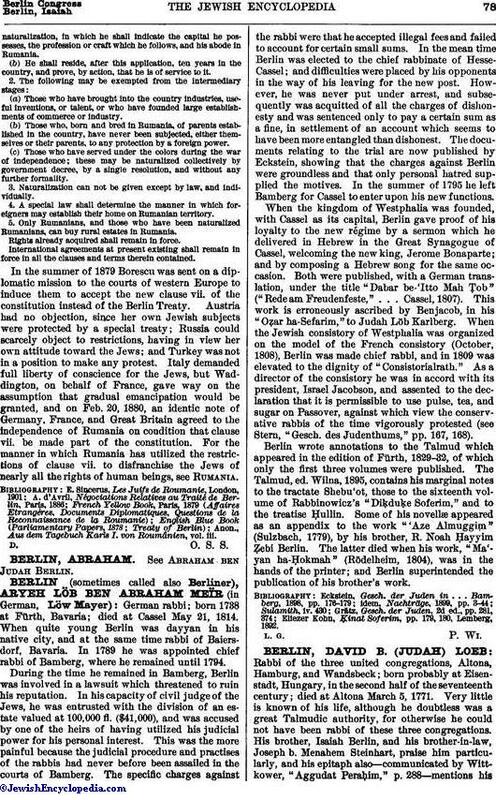 Berlin wrote annotations to the Talmud which appeared in the edition of Fürth, 1829-32, of which only the first three volumes were published. The Talmud, ed. Wilna, 1895, contains his marginal notes to the tractate Shebu'ot, those to the sixteenth volume of Rabbinowicz's " Diḳduḳe Soferim," and to the treatise Ḥullin. Some of his novellæ appeared as an appendix to the work "'Aze Almuggim" (Sulzbach, 1779), by his brother, R. Noah Ḥayyim Ẓebi Berlin. The latter died when his work, "Ma'yan ha-Ḥokmah" (Rödelheim, 1804), was in the hands of the printer; and Berlin superintended the publication of his brother's work. Eliezer Kohn, Ḳinat Soferim, pp. 179, 180, Lemberg, 1892.